When the Obama administration launched its version of Whitehouse.gov, it promised unprecedented openness. But the site's contact page restricted letters to 500 characters. Is that enough to argue complex ideas effectively? After being criticized for the limit, it was expanded. Even so, the Whitehouse.gov feedback form is not really 'open' at all. The Obamagram responds to this uncertainty about how democracy should be formatted in an age of networking and digital media. An 'open letter' is a letter, often critical, addressed to a person or group but intended for publication. 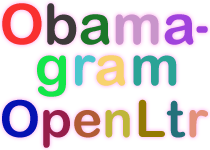 The Obamagram puts a new twist on the open letter by making it anonymous and giving it a rigid form. The orginal, round, arbitrary number 500 is restored as an exact 500 character requirement. Read more. What were you thinking appointing Ray LaHood as Transportation Secretary? m a d e i t a l m o s t i m p o s s i b l e t o p r o s e c u t e t a x c h e a t s .
I t w a s y o u t h a t m a d e t h e l a w t h a t i s f a i l i n g u s ! ! e d t o h a p p e n . S o h o w c a n h e r e m a i n a p u b l i c e n e m y ?